The original AK47 was the first assault rifle to be manufactured, after the original German STG44 (Sturmgewehr 44 ). AK47S, known as AKS47, which is the early development of the AK47 Assault rifle. It equipped with an underfolding metal shoulder stock which similar to that of the German MP40, for use in the restricted space in the BMP infantry combat vehicle, as well as by paratroopers. M870 is a US made pump-action shotgun which is widely used by the public for sport shooting, hunting and self-defense. It is also used by law enforcement and military organizations worldwide. Also M870 has hundreds of variations in different gauges or custom made variants. 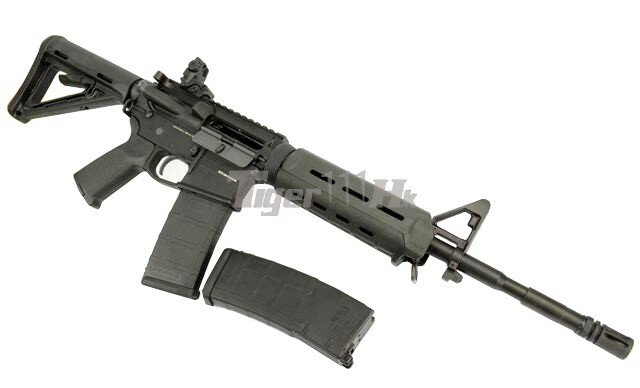 This KWA LM4 GBB Assault Rifle is equipped with PTS accessories including the Metal Frame with PTS marking, MOE handguard, CTR stock, MOE grip (GBB Version) and the PMAG Gas Magazine for both KSC and KWA M4 GBB. Also, KWA LM4 GBB is installed with the newly developed System 7 Two GBB System which makes this LM4 GBB has a great performance either in realistic training or gaming.